It’s a holiday weekend. Are you prepared? Do you have your Easter basket cleaned out and ready for the Easter Bunny to fill up again? Do you have your new Easter dress and Easter shoes? And what about your Easter bonnet? Is it all spruced up and ready to go? Me, either. I won’t be buying an Easter bonnet (I’m not sure where they come from) I doubt if I’ll have a new dress or shoes or a basket, old or new. But I’m ready for Easter. I love that holiday! What a beautiful celebration. The day our Lord rose from the grave. We’ll be celebrating birthdays this Easter. Three of us had birthdays in April–BB and G-Man (happy birthday, darlin!) and me. So for our birthday dinner and to celebrate Easter, we’re having steak. I know you’re supposed to have ham on Easter (I don’t know why. If anybody knows the reason for that tradition, please let me know!) but I’m not very good at following “rules.” For Christmas we have prime rib instead of turkey. At Thanksgiving we have ham and turkey. (See? I can follow tradition once in a while.) And for Easter, we usually have smoked ribs. This year, it’s steak. How good your steak is depends on two things–the quality of the meat you start with (Ribeye is my favorite. Also, we raise our own beef.) and NOT overcooking. Baked potatoes will be on our table. Who doesn’t know how to bake a potato? Wash well, dry, rub on a little vegetable oil and toss into the oven at 425 for an hour or until tender when you poke it with a fork. Serve with butter, sour cream, chives, bacon bits, grated cheese and whatever you enjoy. 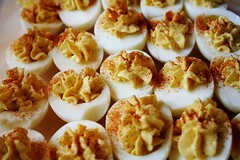 #1 Son usually brings deviled eggs to our get togethers. (Perfect food for that boy to make–deviled. 😉 ) I’m not really sure where deviled eggs get their name. I used to think it was because the best thing to do with the devil is to bite him and send him on his way, but that’s probably wrong. When I worked in Wayne’s Grocery Store (back in high school) we sold something called Deviled Ham. I haven’t eaten it, but I think it has to do with the additional ingredients added to the minced ham. The term “deviled” dates back to the 19th century, referring to the use of particularly hot spices in cooking. Contemporary versions of deviled eggs tend to include a wider range of seasonings and added foods, such as garlic, horseradish, wasabi, cheese, chutney, capers, salsa, hot sauce, mushrooms, spinach, sour cream, caviar, smoked salmon or other seafood, and sardines and may not therefore always be spicy. The term “deviled,” in reference to food, was in use in the 18th century, with the first known print reference appearing in 1786. In the 19th century, it came to be used most often with spicy or zesty food, including eggs prepared with mustard, pepper or other ingredients stuffed in the yolk cavity. Hard boil a dozen eggs (or more, depending on the number of guests you’ll have and how much they like them.) Peel the eggs. (Peeling is the hardest part.) Cut them in half from the pointy end to the round end, remove yolks to a separate bowl. Mash the yolks. Add Miracle Whip, mustard and sweet relish. Sometimes I add a little sweet pickle juice. (How much of everything you add depends on how much yolk mash you have. This is a taste and add recipe.) Mix well. Then put the yolk mixture back in the egg halves, either with a spoon or if you want pretty ones, use a pastry bag with a big star tip on it. A little sweet paprika sprinkled on top makes them very pretty but doesn’t change the flavor much. How will you celebrate Easter? Will you go to church? Even if you haven’t darkened the doors lately, I promise you’ll be welcome. I wouldn’t begin to tell you which church to attend–as long as God is there, you’ll be in the right place. Will you have ham or do you enjoy the less traditional? Will your “big deal meal” be dinner out, noon at home or brunch with loved ones? Will your entire family be there? In spirit, I hope, if they aren’t able to make it to your home. I think all my kids and their sweeties will make it home. I’m planning on it! And if for some reason they can’t, I’ll keep my fingers crossed for next year. How about you? Are you having only family or are you inviting someone who doesn’t have family nearby to share it with? Whatever you do, and whomever you share Easter, enjoy. Categories: Small World Recipes | Tags: Cooking, Deviled egg, Easter, Egg yolk, God, Holidays, Jesus, Miracle Whip | Permalink.